Organising a Florida holiday but can’t find May 2021 Orlando flights? Fares are released 11 months before departure, but it’s not too early to book. We have advance rates on the major airlines, including Norwegian, BA, United and Virgin. Call us on 01934 319 851 for more information. Or complete our enquiry form for a quote by email. Depart early May. Flights are excellent value. Fly direct from Manchester, Gatwick or Glasgow at a great price. Fly mid-week. Tuesday and Wednesday departures are cheaper than weekend flights. Book in advance. An early booking gives us plenty of time to find you a cheap fare. If you need to fly on or around Saturday 15th May or Saturday 22nd May, contact us now. We think these will be the busiest departure dates due to the school half-term. An indirect flight saves money on these peak dates. We achieve great-value Florida fares without compromising on quality. We book with the best – including Virgin Atlantic, British Airways, United and Norwegian. Flights are released 11 months before departure. On release we check the price and continue to monitor fares daily. We book when prices are low. It’s a simple method that yields excellent results. Advance book your May 2021 Florida flights now; early bookers are first in the queue when prices drop. How much do you expect to pay for May 2021 Florida flights? High street fares could exceed £600. Book early to save money. We have advance fares as low as £395 per adult and £320 per child. Need to depart on Saturday 15th May or Saturday 22nd May? Can’t fly mid-week? Don’t worry – Heathrow’s indirect flights are good value. The journey is a few hours longer, but savings are substantial. You could even stay for a few nights in New York; the stopover doesn’t cost anything extra. Call us on 01934 319 851 for options. No problem if you prefer to fly from your local airport; we book connecting flights for a supplement. Schedules are typically convenient and your luggage goes straight through to Orlando. Call us for flights from Belfast, Edinburgh, Inverness, Aberdeen, Isle of Man, Newquay, Exeter and Jersey. If you’re planning a Gulf Coast holiday, Tampa and Fort Myers are convenient arrival airports. For south Florida and the Keys, Miami is the best option. Orlando International is handy for Disney and Universal. Let us know your requirements on our online enquiry form. It’s not too early to book your May 2021 Florida flights – we’re already receiving enquiries for 2021. Advance book now with a deposit of £100pp. Remember, early bookers are first in the queue when prices drop. Add accommodation and car hire to your booking for the complete package. We book all the popular resorts and hotels. Take a look at our example May 2021 Florida holiday for more details. All our May 2021 Orlando flights and holidays are ABTA and ATOL protected. Fly to Orlando for May half-term 2021. 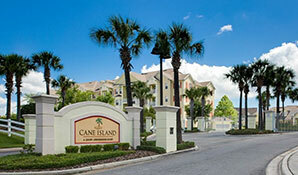 Enjoy two weeks at the popular Cane Island Resort in Kissimmee. The location is ideal for Orlando's top attractions, including Disney World and Universal Studios. Prices start at £875 per person, based on a party of 3 adults and 3 children.